A quick post based on a quick lunchtime visit to a new coffee and sandwich place in Changi Business park. Until the last year or so, there were few options for coffee drinkers in Changi business park - a sliding scale starting at vending machine coffee, reaching convenience store coffee and ending at withdrawal symptoms from giving up altogether. These were not good options. The arrival of a new shopping mall and even more office space has seen a corresponding increase the availability of coffee, from the ever prescient franchise chains, to quirky and interesting places such as Table Manners and Knead to Eat. 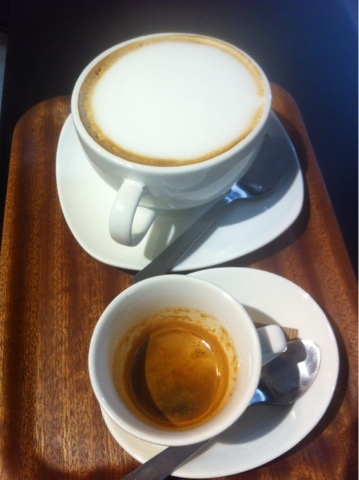 Espresso - there was a small volume of liquid with a light brown crema, so the beans were not stale. The size was consistent with a single shot, so it's unlikely to have been over or under extracted. The first impression was of woody elements with a little bit of bitterness, overall a nicely balanced shot. Not too bitter, with pleasant woody notes and all in all a decent effort. Cappuccino - the serving size is quite large, It's far too milky though, I couldn't taste any coffee. The execution was ok (microbubbles were there, the ratio of foam to milk was correct) but it's just too diluted. Shame to see a good underlying espresso buried under a tsunami of milk, and losing the interesting character that it had. Lattes on the other hand are well executed, and above all else, they're potent! There's a robust coffee flavour from the first sip. The milk has hardly reduced the coffee flavour, and this is a good thing - it's a bold and globose some coffee. The mouthfeel is fine - foam mixes with the milk nicely. Latte art is nicely done. Serving size is fine too - it's a good mixture of flavour and potency. Overall - good underlying espresso shots make for potent and well executed lattes, but skip the cappuccinos. Along with table manners, this is currently the best option for anyone in need of decent coffee in Changi Business Park.